It’s beautiful to watch a child figure out and understand life around them. They learn so effortlessly that it can sometimes be a challenge to provide enough new material to keep up with their growing minds. As an educator, it’s my priority to provide the best education for your child and offer clear and well thought out information for them to take in. Traditionally, reference books, like dictionaries and thesauruses, are not meant to be fun and interesting. This dictionary is not traditional in this sense. I remember never wanting to pick up any reference books as a child (There were so many words and no pictures! BORING!) but wanting to learn everything I could. My goal in writing this comprehensive dictionary (with the help of a great team) was to make a child’s first dictionary be engaging and interesting. The examples are fun and sometimes silly. The bright colors and imagery are meant to draw a child in. The activities are short but made to guide a child to think for themselves. What type of vocabulary will you find in this dictionary? You’ll find a mix of cute words, slang and phrases, and even some words that prepare for tests like GEPT and TOEIC. You will also find differences between American English and British English throughout the book. 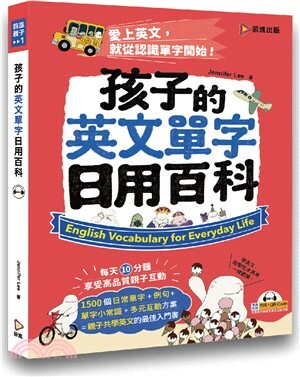 There is enough vocabulary in this dictionary to get a child from a beginner to mid-intermediate level. Vocabulary is organized by topic to help students focus on the overall meaning of a group of words. Because of this, this book is a great resource for both teachers and parents to help plan lessons. Take some time each day to review words from each topic. You’ll soon find that your child has an expansive vocabulary. This dictionary is made to involve parents in their child’s language learning experience and help provide a bonding experience. Working with children is one of the most gratifying experiences, and I hope that you will enjoy this experience with your child as much as I did making this book.